Are you at a point where your business needs more? Do you need more visibility into your efforts? What about your customers? While each business is in a different stage of digital development, eventually, each will get to the point where their email service provider (ESP) combined with their CRM solution needs an upgrade. The logical upgrade would be to combine the two into one feature-rich solution for the entire team, including customer service, marketing automation and more. The good news is there are complete software solutions available with these combined capabilities. 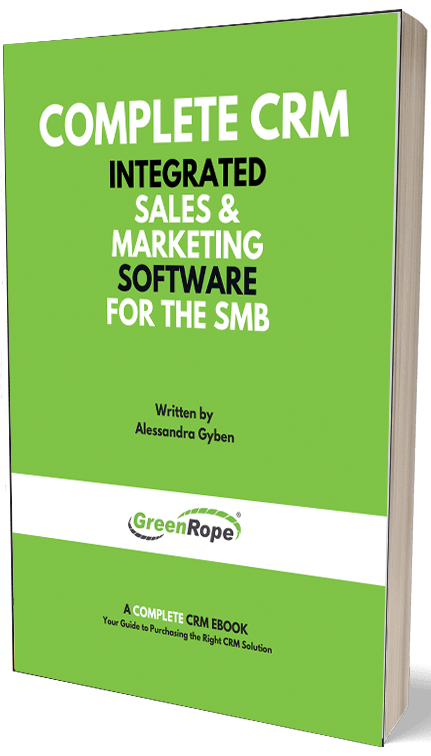 While there are many CRMs on the market that do not offer a full-suite of features, there are tools built for the SMB that integrate sales, marketing and operations into one package. These solutions offer a one-stop shop for the SMB to help them save money and grow without breaking the bank. In order to fully appreciate these comprehensive solutions, businesses must first understand the benefits they offer; in an effort to help, let's examine how combining CRM with marketing automation increases capabilities and visibility. Gaining visibility into your sales pipeline helps both marketing and sales teams gain a more comprehensive perspective into their respective efforts. In other words, they'll have the data they need to better manage existing and prospective customers throughout the entire customer journey. Integrating the two will also give these teams a better idea of how customers flow through their sales funnels. Creating end-to-end customer journeys and workflows create seamless transitions from sales to marketing and helps businesses deliver a more personalized buyer’s journey. With the use of CRM data, your marketing becomes more relevant, powerful, and effective. You’ll gain a 360-degree view of the customer, including all demographic and online behavior, such as analytical data produced from social media, email, SMS marketing, and even print marketing automation efforts! Marketing teams setting up automated emails and workflows benefit when they can readily see existing, former, or prospective contact information such as past communications with sales teams, customer service inquiries, emails opened or clicked on, etc. Additionally, sales teams will benefit when they can see exactly how leads came through the top of the sales funnel, as well as what they're saying and doing on social platforms, review sites, feedback forms, and through other information gathering methods – information which may not integrate or sync with the basic lead data that CRM platforms generally receive. Marketing teams can use the analytics collected in the CRM platform to better understand their target audience and put metrics towards their marketing efforts. For example, you can now see which campaigns are actually bringing in leads, how qualified those leads are, and how they’re engaging with your brand on all levels. Sales teams benefit from this readily available and up-to-date data as well. By better understanding the engagement levels and specific touchpoints, sales teams can make informed outreaches and have a higher chance of converting those new clients! The more engaged, the hotter the contact. Realtime notifications or automation surrounding these behaviors is critical for driving leads down your funnel. It has pretty much become a requirement for businesses to now have an online presence to stay relevant with their customers. Not only do businesses have to keep up with the constant changes in the digital landscape, but they're also feeling pressure to maintain engagement through multiple different digital channels. This is an understandable position for modern businesses, especially, when there are a plethora of channels and opportunities for engagement. Small businesses also struggle in finding the right solution to help manage them all. Unfortunately, there are many software companies out there promising to provide you all the tools you need, but might not be the right one for your business. Of course, there are platforms that will help streamline your business, but it comes down to finding the right capabilities that will work and grow with your company. Even so, businesses must eventually take risks and upgrade their processes; with enough due diligence and discernment this can be a very profitable move. By having a single platform that combines your sales, marketing, and operational efforts will save your business time, money, and energy. The goal is to no longer need to manage and pay for multiple systems, but rather re-allocate this saved time to set up integrated processes to promote the growth of your business. This single platform business model increases transparency and accountability throughout your company and helps enhance your capabilities overall. With all the different types of CRM solutions available today, it's not hard to see how businesses might get confused on which one is the right fit for them. With all the confusion and elevated promises made by each, businesses may be tempted to resign themselves to what works in the short term even if it doesn't offer the capabilities they really need. Eventually, business growth simply demands a more streamlined process with everyday workflows; at this point, an effective strategy is to combine your marketing automation, CRM, and operations into one software solution. This type of innovative upgrade increases the capabilities and visibility of sales and marketing teams with the holistic sales pipeline process, streamlines workflows, and saves time and money. If interested in learning about GreenRope's Complete CRM software solution please contact us today.